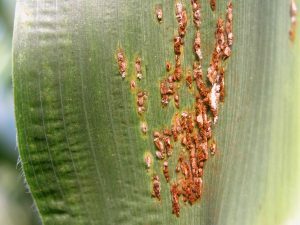 Southern rust of corn has been confirmed in Wisconsin by the University of Wisconsin-Madison Plant Disease Diagnostics Clinic. The sample came in from Kenosha Co. on August 18, 2017. This find is not entirely surprising considering the rapid movement of the southern rust pathogen from the southern U.S. to the northern U.S. this season. 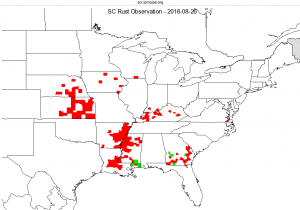 The latest southern rust map can be found at http://ext.ipipe.org. For more information on southern rust, please see my previous post on the subject. You also should visit the Crop Protection Network Southern Rust information page where you can download a brand new fact sheet about southern rust on corn and management of the disease. Note that late planted corn will be more vulnerable to yield loss from the disease. Corn that is still silking (R1 growth stage) to milk (R3 growth stage) is vulnerable to yield loss by southern rust. Corn that is at the R4 (dough) growth stage or later is not as vulnerable and will likely not respond to a fungicide application. Even if corn is at a vulnerable growth stage, remember that we also have to have conducive weather for the pathogen. Extremely dry weather is not conducive for disease. 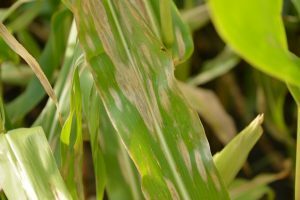 High humidity and temperatures in the 80s favor disease increase. Continue to scout and growth-stage your corn. If you find evidence of what you think is southern rust, I would encourage you to send it to the Plant Disease Diagnostics Clinic for confirmation. If you are like me, you have been paying attention to reports from the southern U.S. indicating that southern rust of corn is making its way further north again this year. You can follow current southern rust updates on the iPiPE site. 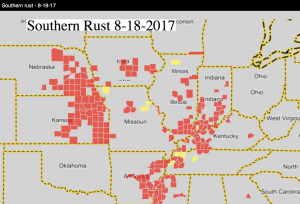 The latest reports place southern rust in central portions of Iowa and Illinois (Fig. 1), which means farmers in Wisconsin need to start paying attention to this issue. Scouting over the next several weeks is going to be critical for making in-season management decisions for this disease. Yield reductions in Wisconsin will be greatest if southern rust moves in prior to the “milk” (R3) growth stage in corn. Lets take a closer look at southern rust and its less damaging relative, common rust. Southern rust is caused by the fungus Puccinia polysora. Symptoms of southern rust are different from common rust in that they are typically smaller in size and are often a brighter orange color (Fig. 2). Pustules of southern rust also typically only develop on the upper surface and will be be more densely clustered. Favorable conditions for southern rust development include high humidity and temperatures around 80F. However, very little free moisture is need for infection to occur. Southern rust is typically a rare occurrence in Wisconsin. When it does occur, it is usually in the southern and south-western portions of the state, with epidemics initiating late in the season. With that said, southern rust did make it to southern Wisconsin in 2016. However, the arrival was well past R3 and yield reductions caused by southern rust were insignificant in Wisconsin. Spores of this fungus have to be blown up from tropical regions or from symptomatic fields in the southern U.S. The fungus can not overwinter in Wisconsin. While southern rust epidemics can be rare events in Wisconsin, the disease can be serious when it occurs. Therefore close monitoring of forecasts and scouting are needed to make timely in-season management decisions. Traditionally resistance was used to manage southern rust. However, in 2008 a resistance-breaking race of the southern rust fungus was confirmed in Georgia. Thus most modern hybrids are considered susceptible to southern rust. Rotation and residue management have no effect on the occurrence of southern rust. The southern rust fungus has to have living corn tissue in order to survive and can not overwinter in Wisconsin. Fungicides are typically used to control southern rust in parts of the U.S. where this is a consistent problem. Efficacy ratings are available for fungicides against southern rust on the Corn Fungicide Efficacy Table. As I said previously, should southern rust make its way to Wisconsin prior to the “milk” (R3) growth stage in corn, it could cause yield reductions. Growers and consultants should scout carefully through the R3 growth stage and be sure to properly identify the type of rust observed. If you need assistance in identifying rust on corn, leaf samples of corn plants can be sent in a sealed plastic bag with NO added moisture to the University of Wisconsin Plant Disease Diagnostic Clinic (PDDC). Information about the clinic and how to send samples can be found by CLICKING HERE. Figure 3. Brick-red Pustules of the common rust fungus on a corn leaf. Common rust is caused by the fungus Puccinia sorghi and is extremely common in Wisconsin, but often results in little yield loss. Most field corn hybrids planted in Wisconsin are very resistant to the disease. Symptoms can include chlorotic flecks that eventually rise and break through the epidermis to produce pustules of brick-red spores (Fig. 3). Typically these pustules are sparsely clustered on the leaf. They can also appear on other parts of the plant including the husks and stalks. Management for common rust primarily focuses on using resistant hybrids. Remember resistance is not immunity, so some pustule development can be observed even on the most resistant hybrids. Some inbred corn lines and specialty corn can be highly susceptible to common rust. Under these circumstances a fungicide may be necessary to control common rust. Most of the hybrids I have scouted this season have some pustules, however incidence and severity is relatively low. Therefore, a fungicide application to control common rust isn’t needed for most of these hybrids in Wisconsin. Residue management or rotation is typically not needed for this disease as inoculum (spores) have to be blown up on weather systems from the southern U.S.
Munkvold, G.P. and White, D.G., editors. 2016. Compendium of Corn Diseases, Fourth Edition. APS Press. Wise, K., Mueller, D., Sisson, A., Smith, D., Bradley, and Robertson, A., editors. 2016. A Farmer’s Guide to Corn Diseases. APS Press. Southern rust of corn has been confirmed for the first time this season by the UW Plant Disease Diagnostic Clinic (PDDC) in Wisconsin. The positive sample was submitted from Rock Co. along the Wisconsin/Illinois state line and confirmed on August 25, 2016. As previously predicted, southern rust did make it to Wisconsin this year, however, its arrival is late enough that it should have minimal impact on yield. 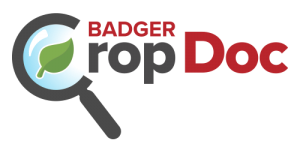 We published an article on WisContext about some reasons why this occurrence was expected in 2016, you can click here to learn more. Most corn in Wisconsin is at least well into the milk stage (R3) or dough (R4). Once corn reaches the milk stage (R3), risk of yield loss from this and other foliar pathogens begins to quickly decline. Thus spraying fungicide at this time of the season is not recommended. If you would like to learn more about telling the difference between the two types of rusts that occur on corn, or management of southern rust specifically, see my previous article by CLICKING HERE. If you need assistance in identifying rust on corn, leaf samples of corn plants can be sent in a sealed plastic bag with NO added moisture to the University of Wisconsin Plant Disease Diagnostic Clinic (PDDC). Information about the clinic and how to send samples can be found by CLICKING HERE. Wisconsin corn continues to remain free of southern rust as of August 10, 2016. However, new confirmations have been reported in southern Indiana (Fig. 1). You should continue to scout the corn crop for southern rust. However, the window of risk is quickly passing for much of Wisconsin. Once corn reaches the milk stage (R3), risk of yield loss from this and other foliar pathogens begins to quickly decline. Thus, as long as corn remains free of southern rust for another week or so, we will be in good shape for the rest of the season. If you need assistance in identifying rust on corn, leaf samples of corn plants can be sent in a sealed plastic bag with NO added moisture to the University of Wisconsin Plant Disease Diagnostic Clinic (PDDC). Information about the clinic and how to send samples can be found by CLICKING HERE. Over the last week concerns have been increasing over corn diseases as we are at the critical time to make fungicide application decisions. See my previous post about the early onset of northern corn leaf blight (NCLB) in Wisconsin in 2016 by CLICKING HERE. While NCLB can be observed in many corn fields in the state, it can be difficult to find. The hot weather this year has managed to keep that disease in check. While now is a good time to scout and make spray decisions, remember that it would take 50% or more of plants in the field with 10% or more of the ear leaves covered with lesions of NCLB prior to the milk growth stage before significant yield loss will occur.  Just this week, the University of Wisconsin-Madison Plant Disease Diagnostic Clinic (PDDC) positively confirmed the first Goss’s wilt sample of 2016. This sample came from Grant Co. Other samples have arrived, but no definitive confirmation has been made in other counties in the state. For information on Goss’s Wilt you can visit my previous posting from 2015 by CLICKING HERE. Figure 1. 2016 Southern Rust Advancement in The U.S. as of July 27. Red highlights indicate counties where southern rust has been confirmed. Southern rust continues to be a disease to scout for in Wisconsin. No positive confirmations have been made in Iowa, Illinois, or Wisconsin. However, the disease has been confirmed in parts of Nebraska (Fig. 1). We have scouted several fields of dent corn and also sweet corn. Only pustules of common rust have been observed in these fields. Conditions have been suitable for this disease over the last several weeks. Remember that rust pathogens have to be blown in from the south. The inoculum of the fungi that cause these diseases do not overwinter in Wisconsin. To learn more about the two types of rust that can affect corn in Wisconsin and how to manage them, CLICK HERE to visit my post from last week. Remember to get out there and SCOUT, SCOUT, SCOUT! Figure 1. Brick-red Pustules of the common rust fungus on a corn leaf. I have been receiving lots of questions over the last couple of weeks about rusts in corn. Folks are identifying pustules of common rust on field and silage corn in Wisconsin. Common rust is caused by the fungus Puccinia sorghi. Symptoms can include chlorotic flecks that eventually rise and break through the epidermis to produce pustules of brick-red spores (Fig. 1). Typically these pustules are sparsely clustered on the leaf. They can also appear on other parts of the plant including the husks and stalks. Conditions that favor the development of common rust are periods of high humidity and nighttime temperatures that remain around 70F with moderate daytime temperatures. This fungus needs very little free moisture for infection to occur. Thus, the weather conditions in Wisconsin over the last month have been somewhat conducive for this disease. However, very hot and dry weather can slow or stop disease development. Management for common rust primarily focuses on resistant hybrids. Most modern commercial hybrids have excellent resistance to common rust. Remember resistance is not immunity, so some pustule development can be observed even on the most resistant hybrids. Some inbred corn lines and specialty corn can be highly susceptible to common rust. Under these circumstances a fungicide may be necessary to control common rust. Fungicides with efficacy toward common rust can be found on the Corn Fungicide Efficacy Table. Most of the hybrids I have scouted this season have some pustules, however incidence and severity is relatively low. Therefore, a fungicide application to control common rust isn’t needed for most of these hybrids in Wisconsin. Residue management or rotation is typically not needed for this disease as inoculum (spores) have to be blown up on weather systems from the southern U.S.
A related rust that we need to pay close attention to this season is southern rust. Southern rust is caused by the fungus Puccinia polysora. Symptoms of southern rust are different from common rust in that they are typically smaller in size and are often a brighter orange color (Fig. 2). Pustules of southern rust also typically only develop on the upper surface and will be be more densely clustered. 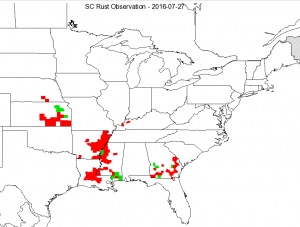 Favorable conditions for southern rust development are similar to those for common rust. high humidity and temperatures around 80F encourage disease development. However, very little free moisture is need for infection to occur. Southern rust is typically a rare occurrence in Wisconsin. When it does occur, it is usually in the southern and southern western portions of the state, with epidemics initiating late in the season. Spores of this fungus have to be blown up from tropical regions or from symptomatic fields in the southern U.S. The fungus can not overwinter in Wisconsin. While southern rust epidemics can be rare events in Wisconsin, the disease can be serious when it occurs. Therefore close monitoring of forecasts and scouting are needed to make timely in-seaosn management decision. 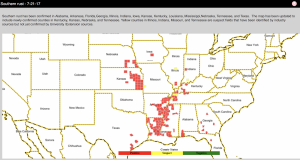 Currently the Corn Southern Rust iPIPE map is showing numerous confirmed cases of southern rust in the southern, southeastern U.S. and Kansas and Kentucky. No confirmed cases have been identified in Illinois, Iowa or Wisconsin. However, close attention should be paid to this disease in 2016 as the confirmed cases this year have been earlier than in the past. This could mean that conditions are ripe for movement of southern rust inoculum into Wisconsin. Traditionally resistance was used to manage southern rust. However, in 2008 a resistance-breaking race of the southern rust fungus was confirmed in Georgia. Thus most modern hybrids are considered susceptible to southern rust. Rotation and residue management have no effect on the occurrence of southern rust. The southern rust fungus has to have living corn tissue in order to survive and can not overwinter in Wisconsin. Fungicides are typically used to control southern rust in parts of the U.S. where this is a consistent problem. Efficacy ratings are also available for fungicides against southern rust on the Corn Fungicide Efficacy Table. Should southern rust make its way to Wisconsin prior to the “milk” (R3) growth stage in corn, it could cause yield reductions. Growers and consultants should scout carefully through the R3 growth stage and be sure to properly identify the type of rust observed. If you need assistance in identifying rust on corn, leaf samples of corn plants can be sent in a sealed plastic bag with NO added moisture to the University of Wisconsin Plant Disease Diagnostic Clinic (PDDC). Information about the clinic and how to send samples can be found by CLICKING HERE.